FOR Pat Lowe, it was a single sweet potato that was the last straw. Grown in rich fertile Australian soil, sorted and selected by hand, it was then unceremoniously wrapped in plastic and dumped on a styrofoam tray in her local Woolies. Ms Lowe, from Broome, says strangling them in unnecessary plastic packaging is no way to treat our fresh fruit and veggies. So much so, a Change.org petitionthe Western Australian started to cut down on plastic waste in the fresh produce aisles, has now garnered more than 120,000 signatures. 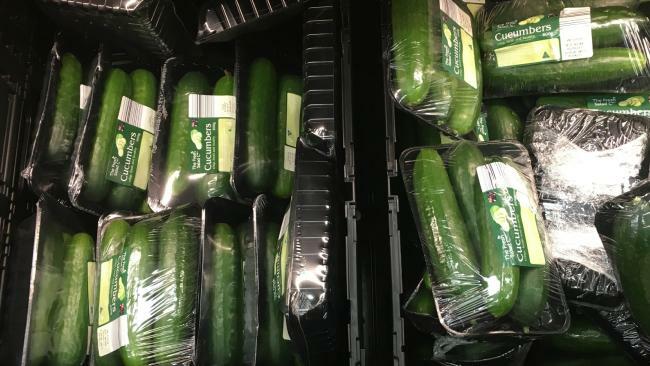 But while the petition is aimed squarely at Coles and Woolworths, it appears Aldi — rather than the big two — could be an even bigger fan of plastic packing. It has also emerged that the fruit and veggies most likely to be packed in plastic were, perversely, those considered the most natural — organic produce. And, in this case, the packing has nothing to do with freshness and everything to do with us shoppers. Ms Lowe used the image of the wrapped potato on her petition to vividly illustrate the problem. But there are plenty more to choose from. “A friend of mine saw all the herbs wrapped up. She was incensed and wanted to make a complaint and I said, it’s not a local thing — we need to go national,” she told News.com.au. The overuse of plastic in supermarkets is in the spotlight. Data from the Australian Packaging Covenant found that in 2015-16 only around 31 per cent of plastic packaging was recycled. While, Channel 10s The Project has teamed up with Clean Up Australia to put pressure on NSW, Victoria and Western Australia to ban single use plastic bags — the last states not to do so. Every supermarket looked at had some produce wrapped in plastic, particularly if it was cut. 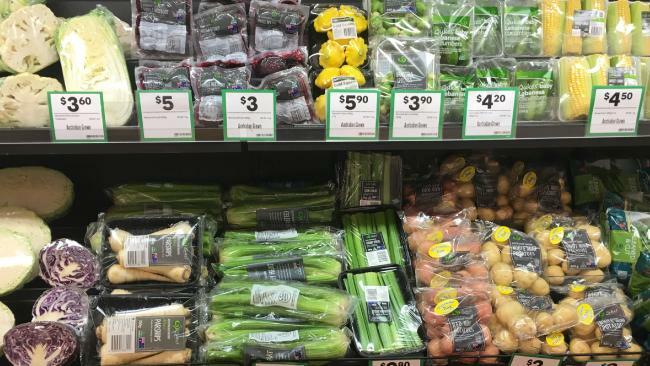 Ms Lowe’s petition calls for Coles and Woolworths to “stop wrapping small portions of herbs, vegetables and fruit in plastic and styrofoam”. As well as saving resources, she says plastic also found its way into the oceans where it was ingested by fish and birds. But how widespread is the use of plastic packaging in supermarkets? Ms Lowe admitted her petition covers neither IGA or Aldi with the German giant only recently reaching the West. So News.com.au surveyed Coles, Woolies, Aldi and a local greengrocer at a shopping centre in Sydney’s inner west. Plastic packaging could be found in all of them. However, in Coles, Woolies and the greengrocer, loose unpacked produce predominated. 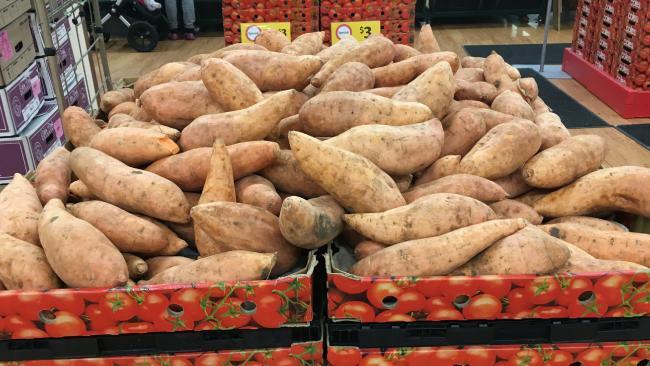 In Coles, far from being on a plastic tray, sweet potatoes were overflowing in great mounds out of giant containers. Most commonly, plastic was found wrapping multiple items of produce also available loose, such as bags of apples, washed salads or cut produce like pumpkins. However, it was the organic section where extra packaging was in abundance. Indeed, Ms Lowe’s image of a sweet potato is of an organic variety. So why are the food stuffs least likely to come into contact with chemicals when being grown then wrapped in plastic? In a statement when the petition originally went up, Coles said it was to “allow differentiation between organic products and conventional products — so that our customers receive what they pay for”. What that means is that without the wrap — and the “organic” sticker on the wrap — checkout staff could accidentally ring up the produce at the lower non-organic price. And, of course, unscrupulous shoppers could also pass of organics as cheaper at the self-serve registers. News.com.au also understands some customers looking for organic find the extra packaging reassuring. It gives an extra level of certainty that the veggies are indeed farmed separately to the usual fare. Woolworths’ non-organic bananas (L) were not packaged. 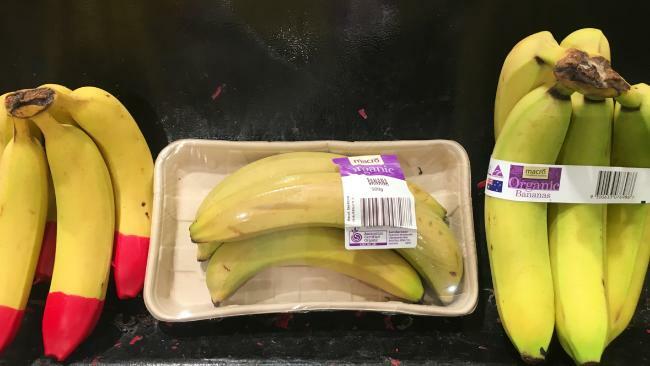 Its organic bananas had two different packages — a cardboard tray and film or a plastic band (R). Ms Lowe’s petition originally went up two years ago. But she resurrected it this month after observing that not much seemed to have changed. “In fact, I’ve seen a few more things, like grapes, end up in plastic,” she said. In just a few days, a further 30,000 people have signed up. Nevertheless, in that two years, some changes have occurred. For instance, in the organic department of the major supermarkets, those offending styrofoam trays are gone — replaced by cardboard. 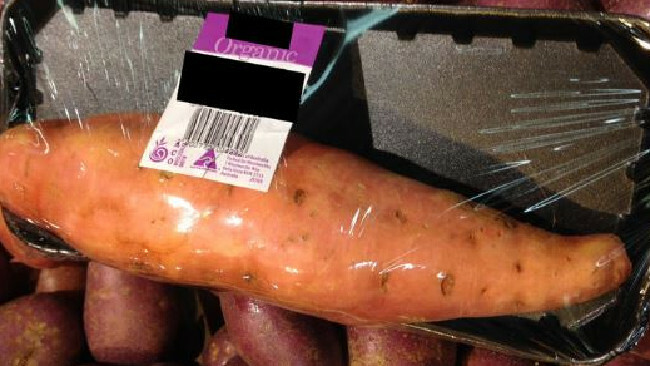 Indeed, in Woolworths, the organic sweet potato no longer sits on a tray at all — it now merely has a small piece of plastic tape wrapped around it with the bar code. Woolies told News.com.au its organic suppliers had adopted recycled packaging. Additionally, polystyrene trays had been eliminated from the organic section. But other plastics were seen outside the organic area. “We will continue to work with all of our suppliers to actively pursue packaging alternatives that reduce the amount of packaging or increasing its recyclability where possible,” a spokeswoman said. 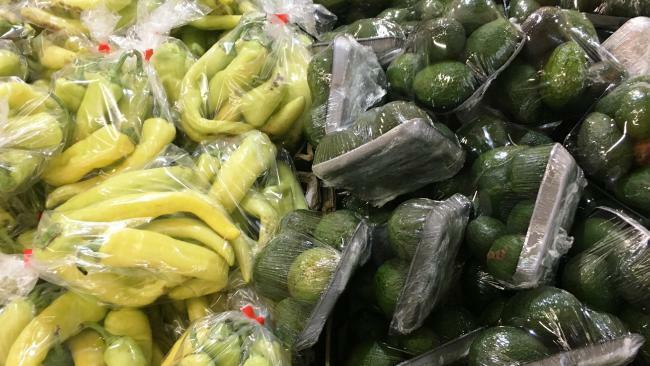 A Coles spokesman said when packing was used for fruit and veggies they used “sustainable options” such as cardboard and polythene terephthalate which can be disposed of in household recycling bins. Although, the plastic film needs to be brought back to stores to be recycled industrially. “We make every effort to prioritise the selling of loose fruit and vegetables to minimise packaging as much as possible. In the independent greengrocer visited plastic could mainly be found around packs of avocados, capsicums, peeled garlic cloves, and cut pumpkins. However, it was in Aldi, now Australia’s third largest supermarket, where plastic was most obvious. Some produce — such as tomatoes, cauliflowers and capsicums — could be bought loose. But bad luck if you want just one cucumber — you could only buy four at a time. Mushrooms, limes, zucchinis and carrots could also only be purchased in plastic. And their plastic packs were substantial. While other retailers had simply a plastic bag of apples, in Aldi the apples were in a plastic container that was then film wrapped. 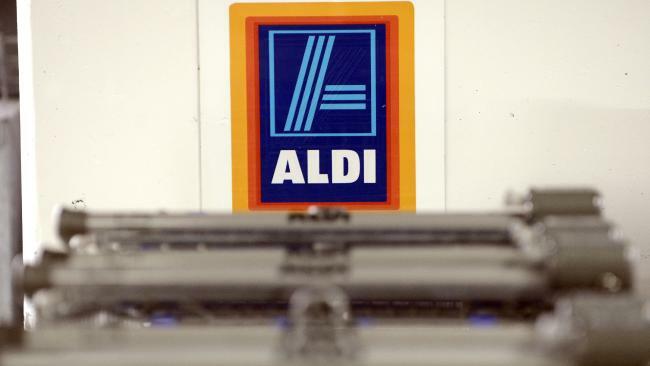 “Aldi Australia packages some of its fresh fruit and vegetables in order to reduce bruising and protect from customer handling,” a spokesman told News.com.au. Pat Lowe is calling on the supermarkets to cut down further on plastic packs. Picture: AAP Image/Dan Peled. The company said it was in the process of, “investigating best practice in plastic packaging design and reduction”. However, Aldi did point out that, unlike its rivals, it has always been opposed to single use plastic bags. Ms Lowe said she was confident the petition would get to 150,000 signatures and she would consider sending it to Aldi as well as Coles and Woolies. Her ideal supermarket, she said, would have all of its fruit and veg loose. If a bag was needed, ones made from recycled materials or quick growing bamboo could be available.